The state that issued the license completed a self-assessment and root cause analysis of their implementation of the pre-licensing guidance and the events that led to granting the license. This evaluation will serve as an important starting point for the NRC and Agreement States, working together, to evaluate their licensing programs and make enhancements to address any vulnerabilities. In addition, the NRC will use its oversight process, the Integrated Materials Performance Evaluation Program, to evaluate this state’s program and ensure that all Agreement States and NRC regional offices continue to fully implement the pre-licensing guidance and other upgrades made to the licensing program after 2007. THREE: Which other harmful conditions, behaviors, actions, and inactions were necessary to the causation of the harms incurred? What is the Policy or Procedure for handling license staff of Agreement States that do not follow licensing procedures? So what?! 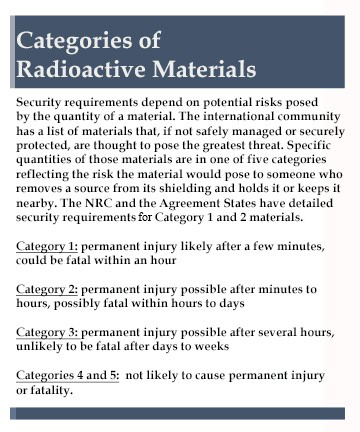 Small quantities of nuke materials are peanuts & that’s why the NRC allows agreement states to “control” them. The NRC needs to turn this small stuff over to the states completely. The NRC needs to focus entirely on protecting us from our aging nuclear power plant fleet! Good work DUNCAN AND ALL.